Despite the fact that the EPR in Flamanville (Manche, France) has been under construction for seven years, French power utility EDF has yet to provide a satisfactory answer to some fundamental questions about nuclear safety. So much so that French official experts are calling a recent choice by EDF about the EPR’s safety “a step backwards”. Time is running out for the French utility, who has only a few months remaining to complete a demonstration of the safety of the EPR. Experts at the French official Institute for Radiological Protection and Nuclear Safety (IRSN) paint another picture. In a report made public on December 4th of last year, the IRSN explains that EDF has made a technical choice on a crucial piece of equipment for the safety of the EPR reactor which “constitutes a step backwards in terms of safety when compared with the design of the reactors of operating nuclear power plants.” What is this part so vital to the EPR’s safety? It concerns a safety valve on the pressurizer. Much like the valve on a pressure cooker, which allows for relieving pressure to keep the cooker from exploding, the safety valve allows steam to escape in case the pressure becomes too great in the primary circuit. This valve is located on the pressurizer, which is responsible for regulating the pressure and temperature of the primary circuit, which contains the nuclear fuel and where water circulates to cool it. Uncontrolled excess pressure in the reactor pressure vessel could lead to its rupture, a major nuclear accident. One of the main causes of the major nuclear accident on Three Mile Island (USA) in March of 1979 arose from a stuck-open valve. Since the building of the first French pressurized water reactors, several failures of safety valves on pressurizers have led to their replacement by safety valves working “in tandem”: a second valve below the first safety valve enables the backup valve to shut if the first one fails to do so. Thus, the EPR presented as “the authority on safety” could be using a less reliable part than the one being used on reactors already in operation in France, the oldest of which have been operating for more than thirty years. It becomes clear why the IRSN sees EDF’s choice as “a step backwards,” and asks EDF to justify it with results from in-depth studies. The French utility puts forth as its defense the significant reliability of the single valve, which is used on a large portion of German nuclear reactors, but will have to be modified for the EPR. In a letter dated October 24th of last year, the ASN has honored the request of the IRSN and refuses to give the valve a waiver that it considers unacceptable. Thomas Houdre affirms: “EDF has not yet proven the capacity of the valve to close reliably.” Why does EDF want to revert to using a part whose reliability has not been proven, and which compels it to ask for an exemption from safety studies, when a valve with an additional safety feature, already in use on its nuclear power plants, is available? Is EDF trying to save money on a part which is paramount to the nuclear safety of the EPR, already five billion euros over budget? The power utility declined to answer this question. EDF hid behind an email response sent to Le Journal de l’énergie on December 11th: “We are in a normal process of technical inquiry. We are pursuing our communication with the IRSN and the ASN in order to provide evidence that the EPR in Flamanville meets all safety requirements.” There’s the rub. How is it that such questions determining the nuclear safety of the EPR have not yet been answered when this reactor should have been up and running for more than two years? Why are there still discussions on the EPR’s fundamental safety components when the reactor has been under construction for seven years? The sticking points on safety of the EPR reactor do not just concern the primary circuit, far from it. An essential piece of safety equipment whose unavailability led to the Fukushima nuclear catastrophe in March of 2011 is also subject to criticism by the IRSN, in a report addressed to the ASN and dated July 18, 2014. It questions the EPR’s emergency diesel generators which supply power to the reactor when external power supply has been lost. A reactor loaded with nuclear fuel is completely dependent on a permanent supply of power in order to cool the nuclear reactor core and the spent fuel immersed in the storage pool. The emergency generators provide essential electricity in case of power losses, without which the fuel begins to melt and the reactor spins out of control. For the record, Areva’s former CEO Anne Lauvergeon, had declared at the time of the Fukushima accident: “If there had been EPRs at Fukushima, the possibility of leaks into the environment would not have existed, no matter what the situation.” We are measuring the gap between these statements and reality. So many flaws and shortcomings in a reactor billed as the last word in safety makes you wonder. Why so many areas of uncertainty about the EPR, which has been in the works since 2007? Even though the EPR was developed in 1992, in 2014 its nuclear safety report is still underway. Clearly EDF still has to make its case for the nuclear safety of the EPR, the number one selling point for building the reactor in Flamanville. Its design can still evolve until the operating license application is submitted, which EDF has announced for March 2015 according to our information. It is therefore urgent that in the next three months EDF try to reinforce its poorly put together arguments to avoid announcing further delays. If the issue of the nuclear safety of the EPR is still unresolved today, the question arises as to what was sold to the French people under the name of the EPR by Areva, EDF and the authorities at the time of the public debate on the EPR in 2005. What was the basis for the EPR’s supposed “unparalleled level of safety” claimed by Areva? At the time no safety report was available on the EPR since EDF had decided not to publish the preliminary report on the safety of the reactor for the public debate. In its entry in the EPR’s public debate report, the Association of Scientists for Information on Nuclear Energy (GSIEN) pointed out that the arguments in favor of the EPR are not supported by any accessible EDF technical document and, in fact, are only more or less dogmatic acts of faith. On reading the IRSN’s 2014 expert safety reports on the EPR, one finds EDF does not seem to have really changed its ways. This article was first published online on December 2014 in French in Le Journal de l’énergie. 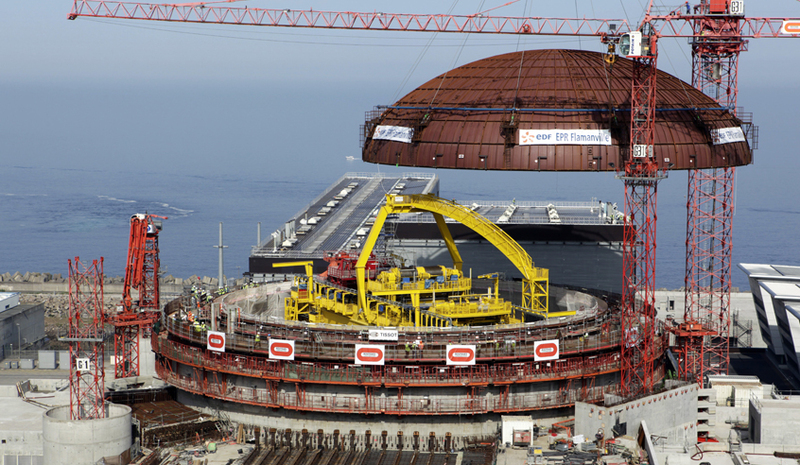 Picture: The dome of the Flamanville EPR reactor building is put in place, July 2013, EDF.